The school says it did nothing wrong. 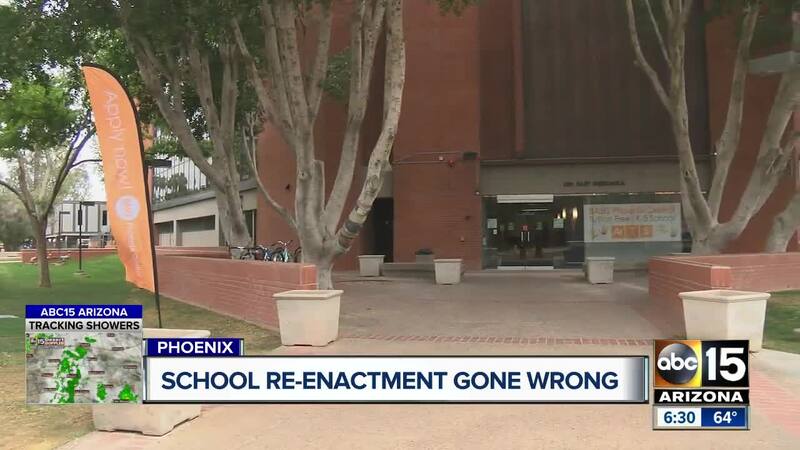 PHOENIX — An Arizona mother is taking to social media to call out her son's school over a class activity she says was racially insensitive. The lesson was meant to transport students to 1957 and the heroic moment the Little Rock Nine entered Little Rock Central High School following desegregation. Images from that day show the nine African-American students walking into the school while being bombarded by racial slurs from those opposing their presence. In a social media post this week, Claudia Rodriguez says her son's third grade class at BASIS Phoenix Central reenacted that moment. She says her son, who is black, was chosen to walk between a line of students while they screamed and humiliated him, something she says affected him deeply. While the school has heard her concerns, they're standing by the activity, pointing out the student volunteered for the exercise and showed no signs he was upset. "The issue is not whether or not the students volunteered because I would imagine young students would volunteer to do all kinds of things, but that doesn't mean they necessarily understand the gravity of that," said Neal Lester. Lester is the director for Project Humanities at Arizona State University. He says not only does this reenactment seem insensitive, but questions what exactly students are getting out of it. "It makes me wonder how and if these students are really being taught lessons that are healthy for them," Lester said. He says he'd like to know exactly what the lesson plan was trying to prove and if there were better options. The school says no racial slurs or words of any kind were used, only noises and yelling. They say they've done this with their classes in the past without a problem. In fact, they claim their students come away with a much broader understanding of what segregation was like. Head of School Rosalind Thompson, who is also African-American, continues to support the lesson, citing her own race, experience and understanding of the civil right movement as her reasoning. In a statement on the school's Facebook page, Thompson said the students complied with directions to yell as a way to make noise, without using words. "After the brief exercise, the class came together as a group and discussed what that felt like, how it likely made those heroic students in Little Rock feel, and how it compares to the loving and nurturing experience our students feel each day," Thompson said. "What I hear in that statement is not any sort of acknowledgment that maybe this was a misjudgment, maybe this was a problem that we can't even anticipate what the potential consequences of that might be," Lester said. The school says they've had tremendous support from other parents who say the lesson gave their children an important perspective on civil rights. They also say they have met with local African American leaders in the community about this subject and best practices moving forward. Rodriguez considered but decided against pulling her son from the school.